Clearly 2009 has produced a record for high yield bonds and leveraged loan defaults. But the debate had centered around the state of the over-leveraged US corporations (mostly the products of LBOs) in 2010. JPMorgan's change in default rate forecast for 2010 for non-investment grade companies is astounding. What drove them to change their view so drastically? It was actually two trends that dominated the non-investment grade corporate markets this year. 1. The opening of the primary HY bond market allowed firms to issue new bonds to refinance their existing debt, particularly their loans. 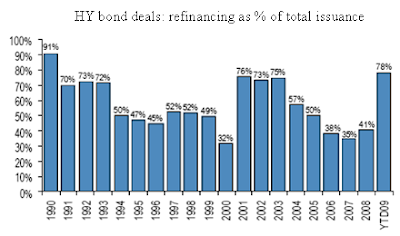 The chart below shows that the bulk of new issues were to refinance debt instead of for expansion or acquisitions. 2. "Amend and extend" allowed stressed firms to avoid bankruptcy by rolling their existing loans into longer maturities. Some of this of course is just "kicking the can down the road", but it makes for a less tumultuous 2010.